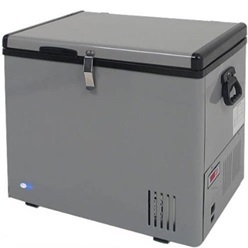 If you are looking for portable freezers that will give you the most bang for your buck, we highly recommend that select one which can at least be switched between a freezer and a fridge. Some can even function as fridges and freezers at the same time! If you are looking to get value for money, be sure to check out these bestsellers. A capacity of 45 Quarts. This is enough to chill sixty 12 ounce cans so there’s no excuse for staying thirsty on your long road trip. The "Fast Freeze" mode rapidly cools to -8°F, making it easy to cheaply restock up on bulk-purchased drinks which you can then chill yourself. So no need to pop into a 7-eleven store and pay more for already chilled drinks. The Whynter portable freezer fridge has true freezer capability and can cool between -8°F to 50°F and is therefore far more value for money than the 12 volt "coolers" that sell for so much less. An LED screen conveniently displays the temperature on the exterior so with a glance, you can know how well chilled or frozen your food is. 2 removable wire baskets are included. These are terrific for food organization. 2 power cords are included with your purchase. The 8-feet AC power cord is designed for use with a standard household 110 Volt outlet. The 5-feet DC power cord is designed for use in a car or off-grid location such as a camp as it can be powered by car batteries, generators and solar panels. It is built to North American electrical standards. This saves you the hassle and cost of buying a converter. It’s platinum, so it's visually appealing. Its 52 quart. 1.7 cubic feet can hold up to 68 - 12 ounce cans. It is therefore a great choice if you find the 45 Quart Whynter fridge freezer above a tad too small. With its large LED screen display, even your kids and grandkids can accurately read out the temperature for you. Good option too, if your eyesight is beginning to fail due to age. The soft-touch operating panel makes setting and adjusting your temperature a painless exercise. Three stage battery monitor tells you how well-powered your portable freezer is. It has an impact and weather-resistant cabinet making it popular for meeting refrigerating and freezing needs. 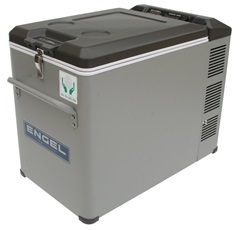 The Engel line of portable fridge freezers is popular because of its legendary reliability and efficiency in extreme conditions. It has a capacity of 40 Quarts. This means it’s truly portable so you can use it at home, in an RV or take it anywhere. Its wide temperature range of 40°F to below 0°F is great for refrigerating drinks or freezing food on the go. It operates off 12V or 24V DC or 110V AC. So, you can power it with your domestic mains or your automotive battery. It comes ready to operate from a 12V cigarette lighter type outlet or 110V AC outlet. It’s famous for its ultra-efficient cooling. This is because the Engel swing compressor system uses 40% less power than typical compressors! Its rugged design makes it durable and weather resistant. So it can withstand use on the motor boat or at an outdoor camp. The lid is conveniently reversible so you don’t have to turn it around in order to access what’s inside. 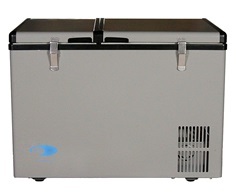 It has a capacity of 62 Quarts and is large enough to meet your mobile freezing and refrigeration needs. What sets it apart is that it has 2 separately controlled temperature zones. So you can set one zone as a refrigerator and the other as a freezer. It works with either a standard household 110 Volt outlet or a 12 Volt power source like an automotive battery making it a truly portable freezer. The internal LED lights allow for easier and convenient access in low-light conditions that you will typically encounter during outdoor camping, for example. It cools to between -8°F to 50°F, so this has true (sub-zero) freezer capability. It works with either 12/24V DC or 110V/120V AC power sources. And, both AC and DC cords come as standard with your investment. It’s vibration resistant making it ideal for use in the harshest of conditions. And, it will operate well even when inclined up to 30° off level. So it’s great for venturing out on the rough high seas. 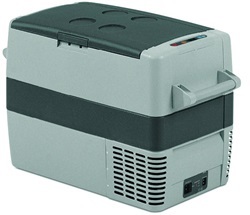 It is solar-compatible and is a great choice if you are looking for a solar freezer or refrigerator. It’s environment-friendly as its compressor is certified as 100% CFC-free. It has true freezer capability as it can reach 0°F. Its adjustable temperature control means it can double up as a fridge or freezer. Every single model comes with a 2-year manufacturer's warranty. In other words, manufacturing defects will be remedied at no additional cost to you if these are reported within 2 years of purchase. So be sure to store your receipt in a safe place. You can make it lockable by adding an Engel hinge lock. 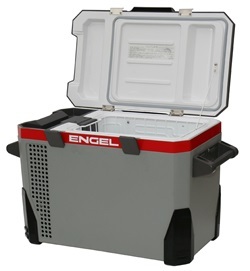 It offers a capacity of 80 Quarts, by far the largest in the bestselling portable fridge/freezer category. It measures 23 6/16" H x 28 3/16" W x 18 12/16" D. So be sure you have enough room in your car, RV or motorboat before selecting it. It offers wide variable temperature options that range from 50°F to -8°F. The latter means it has true freezer capacity, far superior to the coolers that cost much less. 1 large basket and 1 small storage basket make it easy to organize your food. It has a fast freeze mode so it can rapidly reach the coldest setting, making it possible to safely store your catch while out on a fishing expedition. It is designed to work with North American AC and DC power sources. 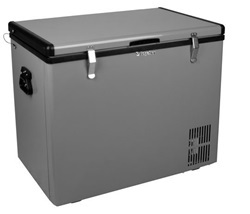 With its latched lid, this freezer is easily lockable if you have a pair of padlocks handy. Side handles make it easy to move this large freezer around and is a reminder that you should not try to lift this portable freezer alone. It’s gray, meaning that it will not easily show dirt.